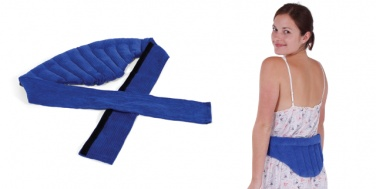 The lupin lower back wrap can be used to provide relief to any part of the body. The adjustable belt allows the segmented lupins to be held against the back. Hands free relief without interrupting daily commitments. May be used hot or cold, microwave for warmth , freeze for cooling relief. Hand made in Australia, with Australian lupins. Outer fabric is 100% natural cotton corduroy.